Left Manatee Pocket after fueling at the nearby fuel dock. Radioed Quest and found they were just clearing the inlet so we cast off and headed after them. Raised the sails outside of the inlet and headed off. They left us in the dust. 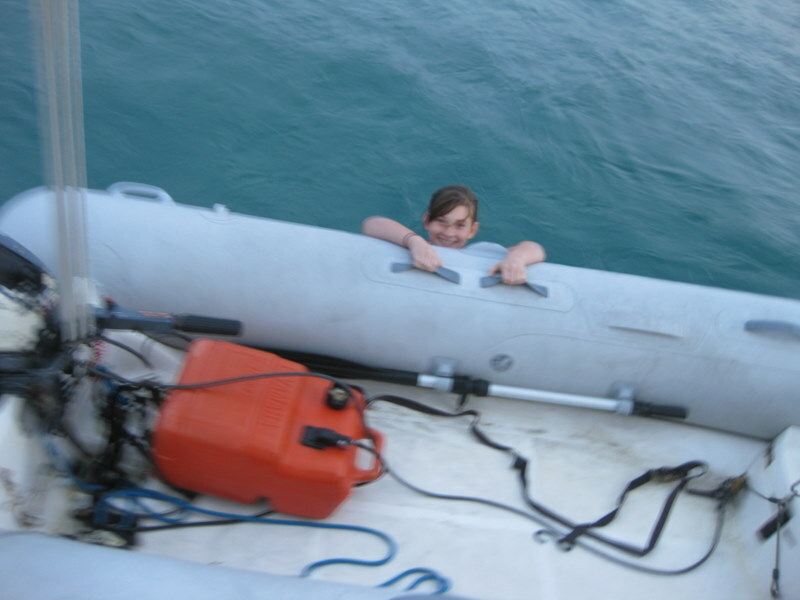 We had problems with one of the reefing lines so we had to sail with a reef in the main that we didn’t really need. Finally – after suffering with poor speeds for a couple of hours we added an extra 2 knots by motor-sailing. Just an hour from the Lake Worth Inlet, Pam had enough and demanded that we sail. We had a nice 5 knot sail to our destination. Anchored off Peanut Island. Lake Worth used to be a fresh water lake but Henry Flagler decided he wanted his lake front property to be ocean front so he cut the inlet to the ocean that is used to this day by lots of commercial ships. We will stay here until the weather window presents itself. Glen’s first retirement paycheque wasn’t deposited along with Pam’s regular check so, upon phoning we found out that a couple of minor issues on the retirement application forms were holding us up. Now we have to get to a Staples or business center of some kind to download forms, sign them properly and fax them back to PensionsBC. Had dinner with Sid and Linda from Quest – great to get to know them better. Cousin Duane has been trying to hook up with us but we were surprised on Saturday morning to get a call from him saying he was 10 minutes away. He doesn’t screw around – when he says he’s coming… he is coming. 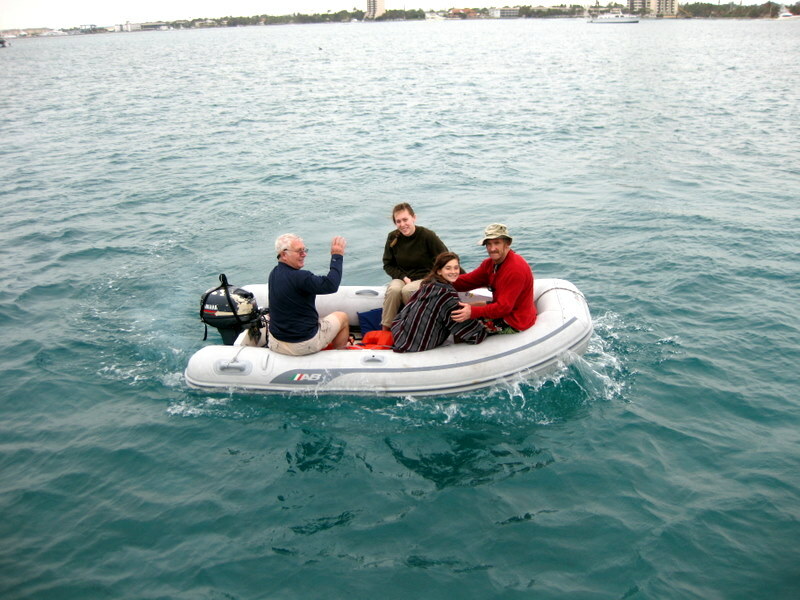 So Glen motored to the dock and picked up Duane and his two girls, Katie and Tara. They’d had a rough night so they sacked out for a couple of hours while we putzed around doing little chores. 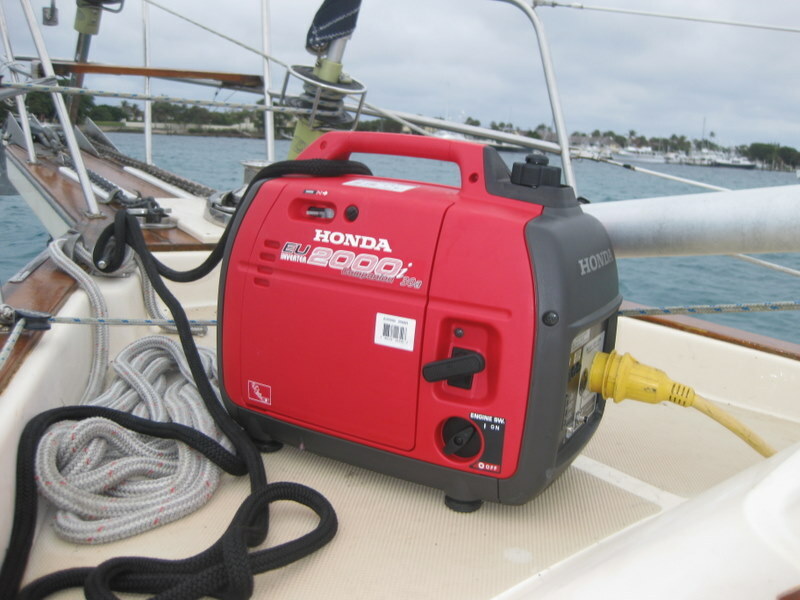 Then, Duane took Pam and Glen out to deal with the pension issue in his rental car and – on an impulse Glen decided to purchase a Honda generator. They are ubiquitous and it seemed like a great solution to our power problems. So now we have power from the engine alternator, from the solar panels and a generator backup if we need it. Sid and Linda touched bases to let us know they were going to take off at first light to Ft. Lauderdale. Had supper with Duane and the kids, watched a movie and then went to bed. Tara and Duane decided to swim with the manatees. The Godfreys are off on their adventure – heading to see Aunt Lisa in Ft. Lauderdale and then on to Key West. 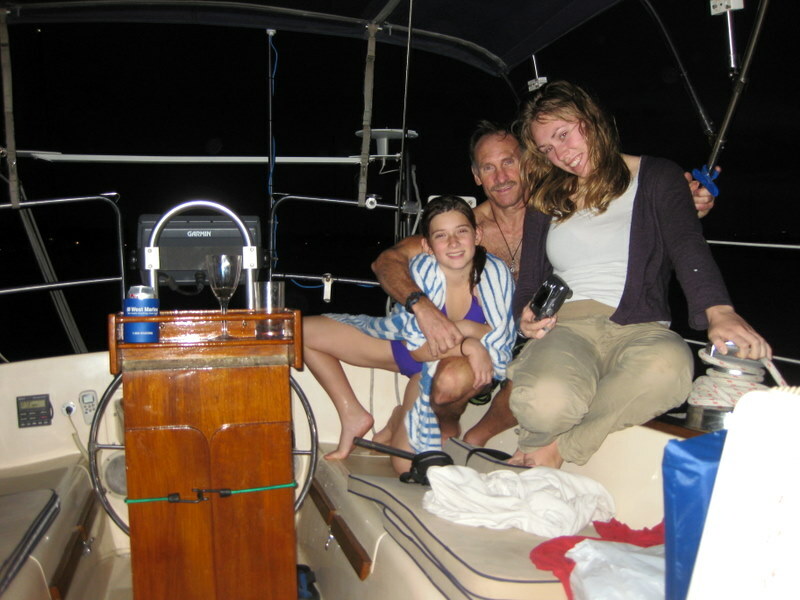 Duane lives life large and his two girls are awesome, adaptable, easygoing travelers. Hi Guys. Tomorrow is your crossing day, Good luck. hope you get the weather. Looks like you're expert bloggers as well as sailors. Hope your retirement cheques & warm weather come soon. Diana and I spent our Christmas in Puerto Vallarta, enjoying the warm weather and great restaurants, thinking we should have stayed longer. All the best as you cruise south.